The shop La Vecchia Faenza has a surface of 200 square meters exhibiting different ceramic styles, shapes and decorations, representing all types of majolica worked by La Vecchia Faenza and Laura Silvagni. In the laboratory next to it is possible to observe the ceramists at work. The glazing, decorating and pottery firing production stages are performed. We organize free guided tours for schools, groups and individuals, booking is recommended. The shop and workshop are located in Faenza (Ravenna) in Via S. Ippolito 23/A. The shop offers artistic ceramics produced by Laura Silvagni and her ceramist artisans. The ceramists are always present in the shop and available to explain and show Faenza majolica processing techniques. The decoration of the majolica takes place inside the shop. The shop is located in the centre of Faenza (Ravenna) in Corso Garibaldi 12/A. 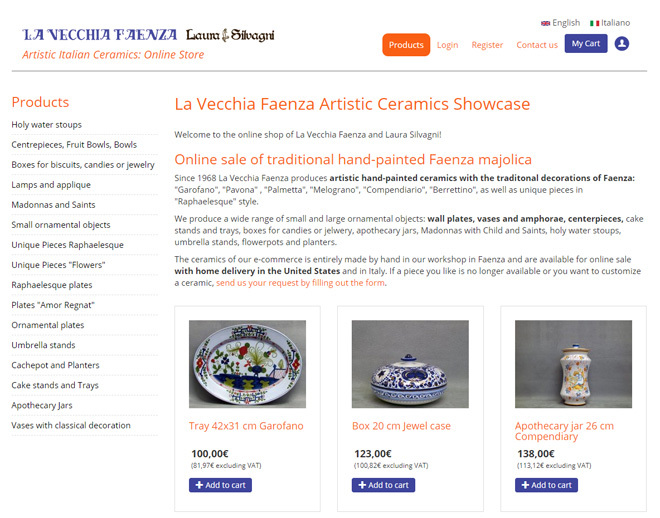 From June 2012 our e-commerce is online, where you will find a beautiful selection of majolica made in La Vecchia Faenza and Laura Silvagni shops. If you are interested in our production of artistic ceramics, we advise you to visit e-commerce often: the product catalog is constantly updated and in many cases it is unique pieces. If you see something you like, catch the moment, do not wait until tomorrow! Once sold, the objects will be replaced by similar products, never the same.